Jim Hall takes his March Madness script to the next level. Every year in March, my office closely follows the NCAA college basketball tournament, also known as March Madness. You can print out a bracket and make your own predictions as to which team will win at each round. Several of my co-workers take this somewhat seriously, and they always print out their brackets and tack them to their work cubes for all to see. Generally, the winner buys a pizza lunch for the others who played. I like to join in, but unfortunately, I lack one thing to participate effectively: I don't really follow basketball. But, I don't like to miss out on March Madness, so a few years ago, I created a Bash script to help me fill out my March Madness bracket. This worked pretty well. I ran the script, and then I used the results to fill out my March Madness bracket. See my previous two articles for more info on the script: Bash Shell Script: Building a Better March Madness Bracket (2017) and Bash Shell Script: Building Your March Madness Bracket (2016). This year, I decided to take things to the next level. Rather than run a Bash script, why not create a web page that automatically fills in the winners for each round? That way I won't really even need to fill out a March Madness bracket; I can just print out the results from my web page. In the NCAA college basketball tournament, 64 teams from four regions compete in a series of single-elimination games. "Single-elimination" means that after each round, the winning teams move on to the next round; the losing teams are out. The NCAA seeds the first round with the top teams from each region and assigns a ranking value to each team. Usually, the higher-rated teams (1–8) fare better than the lower-rated teams (9–16). Under this assumption, a rank 1 team (A) versus a rank 16 team (B) would generate a virtual die with a=16-1+1=16 "team A" sides and b=16-16+1=1 "team B" sides, resulting in a 17-sided die. Similarly, a more even match, such as a rank 8 team versus a rank 9 team, would create a die with a=16-8+1=9 "team A" sides and b=16-9+1=8 "team B" sides, resulting in another 17-sided die. It's not always a 17-sided die, however. A rank 1 team against a rank 9 team would generate a die with a=16-1+1=16 "team A" sides and b=16-9+1=8 "team B" sides, or a 24-sided die. The guesswinner() function takes two arguments, the rank values of teams A and B, and returns the winner. The function calculates the relative chances to win based on ranks of the two teams, then uses the rand() function to guess a random number between 1 and the sum of the chances to win. Note that you can use rand() in two ways: if you call rand() with no arguments, the PHP function returns a random value between 0 and some maximum value. If you provide two values as arguments, rand() gives a random number between those two values. For example, rand(1, n) returns a random number between 1 and n, inclusive. Using this simple method, a rank 1 team will have a much greater chance at winning over a rank 16 team, but a rank 8 team will have about even odds with a rank 9 team. This is the same as building a virtual "die" and making a "roll" through random numbers. The above PHP code gives a series of results for a single-elimination bracket, but the resulting HTML code needs some styling for it to look like a bracket. 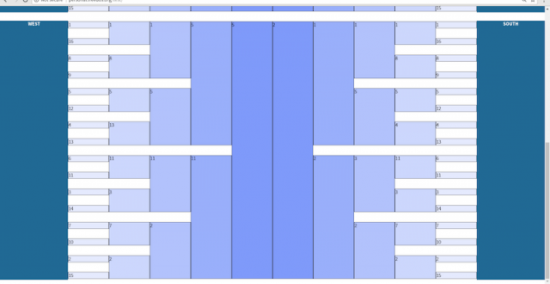 For that, I've used a neat function in Cascading Style Sheets: the Flexbox. 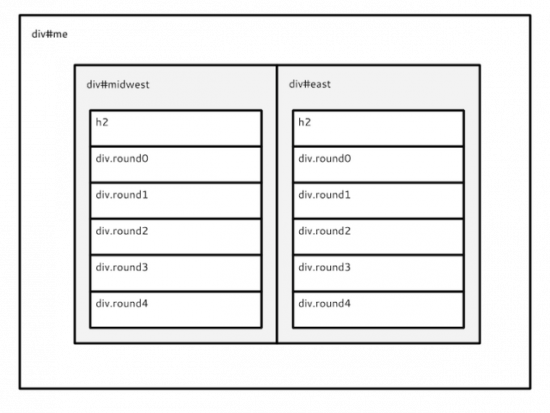 To explain the Flexbox, first understand that the HTML is a set of nested elements, <div> and <p>. Let's walk through them. The outermost elements are two divs. The first div contains the results from the Midwest and East regions: div#me. The second div contains the results from the West and South regions: div#ws. The paragraphs for the results of each contest are not shown, or the example would be quite long! Every time you run the PHP code, such as in a web page, you will generate a fresh NCAA March Madness basketball bracket. It's entirely random, so each iteration of the bracket will be different. Figures 1 and 2 show sample runs. 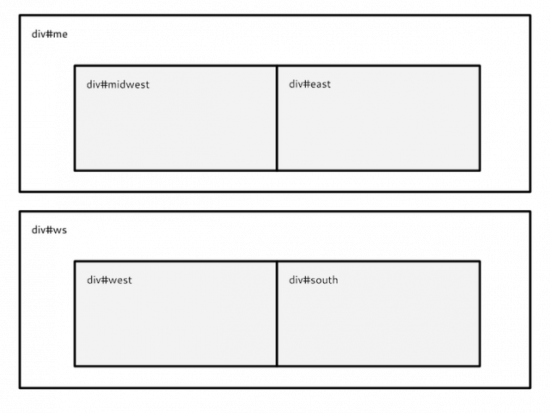 In this sample run, my script selects team 5 in the Midwest region, team 1 in the East, team 5 in the West and team 2 in the South. The bracket is mostly predictable; higher-ranking teams tend to win over lower-ranking teams. But there are a few upsets, such as Midwest team 11 advancing through several rounds, despite going up against higher-ranked teams (6 vs. 11, and 11 vs. 3) before facing defeat to a higher-ranked team. This bracket is a fairly realistic simulation of an NCAA March Madness bracket, and that's enough to match my brackets against my friends who follow college basketball. The point of using a script to build your NCAA March Madness basket bracket isn't to take away the fun of the game. On the contrary, since I don't have much familiarity with basketball, building my bracket programmatically allows me to participate in the office basketball pool. It's entertaining without requiring much familiarity with sports statistics. My script gives me a reason to follow the games, but without the emotional investment if my bracket doesn't perform well.